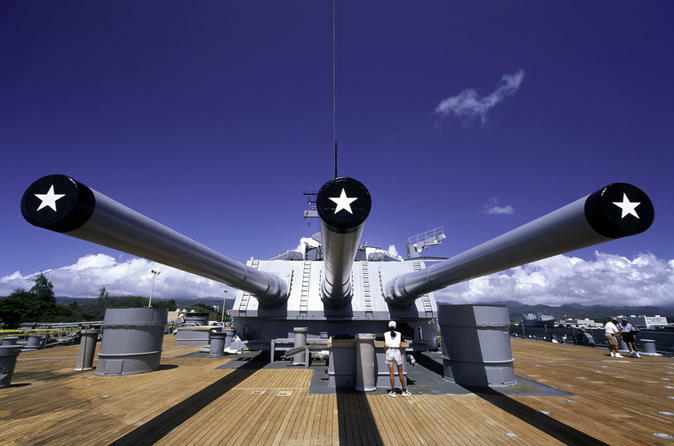 This exciting Oahu tour to Pearl Harbor is a full immersion experience into World War II history. From the site of the Japanese attack at Pearl Harbor to the signing of the surrender aboard the USS Missouri, you’ll walk in the footsteps of America’s courageous heroes. See the USS Arizona, the resting place of more than 1,000 sailors killed in the 1941 attacks, and jump aboard the USS Bowfin to learn about its key role in the WWII battles. Next, you’ll enjoy an audio-guided tour aboard one of the world’s most famous submarines, the USS Bowfin, which is nicknamed the “Pearl Harbor Avenger” for its instrumental role in the epic WWII battles in the Pacific. Then head to Hawaii’s newest and most exciting museum, Pacific Aviation Museum, and fly back in time to learn about history’s greatest aviation heroes. Finally, take a special guided tour of the United States’ last and most famous battleship, the USS Missouri, where the Japanese surrendered to the Allies in 1945. This tour will provide you with a complete Pearl Harbor experience, as well as unforgettable memories of Hawaii. *guests should arrive at pickup locations 10 mins prior to departure time. Please allow up to 10 mins flexibility in departure times due to traffic. Pickup locations & times may vary due to local events, therefore a 24 hour hotel pick-up reconfirmation is required. Special Needs requests must be called in to the local supplier AT LEAST 1 week prior to tour date. All special needs requests are handled and accommodated on a situational basis. Park Service and will advise when normal operations resume. All museums, bookstore, shore side informational placards are still available at Pearl Harbor. The last update from Pearl Harbor is they hope to have the repairs done in early 2019.